Degus are herbivores, which means that they only eat vegetables. In the wild degus live in rocky areas, and on these rocks only grasses, seeds and cereals grow. These are eaten by the degus. Fibres are very important in the degu's food . It's best to give your degus a mix of guinea pig- and chinchilla-food. You can also choose to give them degu-food, which is available especially for degus, but this food is hard to get (most pet's stores don't sell it) and it's relatively expensive. You also need to give your degus hay. They like to eat it and it's very healthy for degus, because there are a lot of fibres in it. Some kinds of food are not suitable for degus, because they are unhealthy. First it's very important not to give them (too much) sugars ! 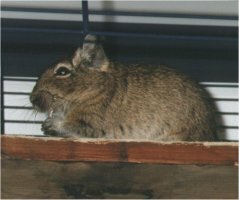 Degus cannot digest sugars; They can get problems with their intestines by eating sugars, and possibly they develop diabetes. There are a lot of sugars in fruit, raisins and some kinds of vegetables. That's why you shouldn't give your degus (much of) these. Secondly, you should be careful when giving your degus peanuts and sunflower-kernels. Degus love these things, but they are certainly not healthy. 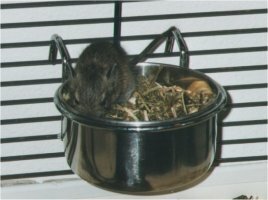 Peanuts and sunflower-kernels have much fat and oil as ingredients, which are not good for degus. You can give them a peanut or some sunflower-kernels once in while, that won't hurt, but don't give too much of it ! When degus eat too much fat, they can develop diabetes, which cannot be cured. 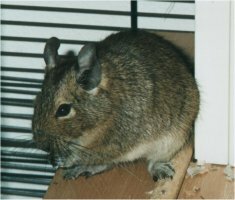 Degus are very sensitive to this disease, and you should feed your degus in a sensible way, to prevent them from getting diabetes. You can best check the food you want to give your degus, before giving it. Some sorts of rodent's food and hamster-food have much ingredients which are absolutely unhealthy for degus, like peanuts, raisins and sunflower-kernels. You can give your degus as much food as you like. Degus stop eating when they have had enough, and they will leave the rest of the food in the manger until they become hungry again. When they have a lot of food, they will bury some of it. If you give your degus enough food and water, you can leave your degus alone for a few days without any troubles.